As one of the many companies to announce their entry into the world of Wear OS at Baselworld a year ago, Guess is now an official competitor in the ever-growing field of designer smartwatches. That means that the fashion brand will forego the battle with other Wear heavyweights, such as LG and Huawei, and instead look to edge out those sitting under the Fossil Group and Movado banner, like Michael Kors, Kate Spade and Tommy Hilfiger. And as with many of its rivals, there's plenty of options within Guess' Wear range. Women have access to the Jemma line, while a unisex option, the Cassidy, is also available. We've spent considerable time with the men's equivalent of that pairing, the Ace, in order to find out how the company's Wear debut stacks up to the rest of the pack. Read on for our full verdict. If you've been a keen follower of Guess' smartwatch efforts, you'll know that this isn't its first dip into the world of smartwatches. Back in heady days of 2015, the company teamed up with Martian and created a hybrid styled on the popular 'dumb' Rigor model. Time has moved on, as has smartwatch design — considerably. 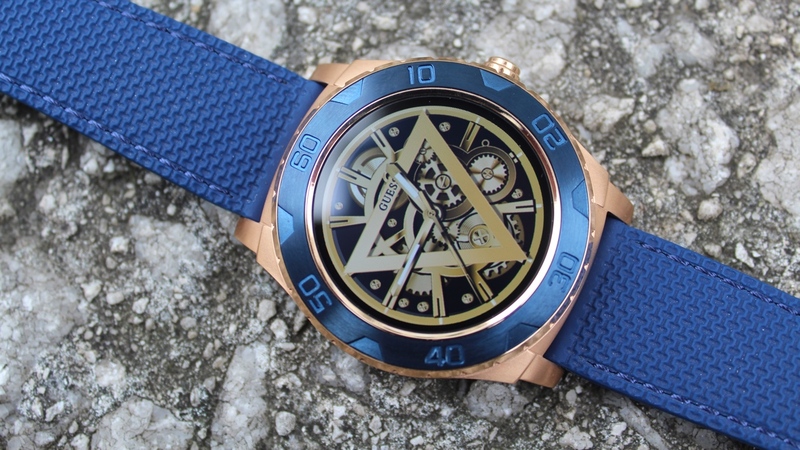 And that means that although the Guess Connect Ace does bear some resemblance to its older sibling (mainly through the same blue-gold colour scheme), the two are leagues apart in what prospective owners are placing on their wrist. As we mentioned, there's plenty to choose from in Guess' Connect line. Our model, the Ace, clocks in at 44mm and is available in four different variations. Women, meanwhile, can get something slightly smaller with the 41mm Jemma, while the unisex Cassidy models also register at the same size. We tried on all three before getting our hands on the Ace, and while there is disparity in the width of the bezel, the chunkiness is much the same throughout the collection. If you have wrists on the larger side, this won't look or feel out of place — in fact, we really like how this sat on our wrist in comparison to other Wear watches — but that doesn't mean it couldn't stand to lose a little weight in the body. And if you have smaller wrists and are used to more to svelte models, we'd recommend picking up one of the designs with a silicon strap, and not their metal band twins, since they sit a little lighter. So, that's how it feels when being worn, but how do we rate the look? Overall, we're big fans. Sure, this is a bold, flashy design — about as bold and flashy as you can find in the smartwatch market — but the work of others in the area has shown that this isn't necessarily a bad thing. We've seen plenty of milquetoast options from Fossil over the years, and its nice to see that fashion brands are willing to exercise their strengths and provide something that's genuinely eye-catching. We've had more positive comments on the Guess Connect Ace than most Wear OS devices we've tried on over the past 12 months, that's for sure. That's aided by the simplistic finish around the bezel. Unlike the original Guess Connect hybrid, there are no ugly screws in the bezel, or overextended lugs, and there's only one button to play with. That does make things slightly more challenging when navigating, but, since the strong suit of this watch is the looks, we can't say we're overly concerned with having to touch the screen a little bit more instead of pushing a button. With that said, the 390 x 390 AMOLED screen is a complete fingerprint magnet. You don't even need to lay a hand on it and it'll somehow pick up all kinds of marks. That can become a little irksome if you have the always-on screen disabled, but generally it's vibrant and colourful enough to make sure you don't feel the need to clean it every time you glance for the time. By now, we're well accustomed to the package that designer brands are serving up through Wear OS. The crux of these watches is their looks, so it's probably best to look elsewhere if you're expecting the likes of heart rate tracking, GPS, waterproofing and other exercise-centric features. So, what do you get? Well, in truth, there's little to write home about, with Guess following the lead of Emporio Armani et al. and providing a base-level Wear OS experience here. That's not necessarily a bad thing; people buying these watches don't necessarily care about all the bells and whistles that come attached to Google's smartwatch operating system, but that puts more emphasis on the smaller details around this minimalistic watch. Take watch faces, for example. The Guess Connect offers a range of different digital and traditional styles for you to choose from, with customisation options allowing you to mix up colours and complications. That's something we consistently appreciate through designer Wear watches — you can easily get lost trying to match the best colour combinations together and swiping between them once you get bored. As we say, it's touches like this which end up becoming the highlight of the software experience, with things like Google Pay - surprise, surprise - lacking under the hood. With contactless payments surging, it really is disappointing to see this missed off by pretty much the entirety of the fashion brands involved with Wear OS, including Guess, but we're hopeful that the payment feature will become a staple in the next generation. This omission, as well as the lack of fitness smarts and a Guess micro-app, means that you won't be spending too much actually interacting with the device. That is, unless, you have pateince for the apps within the standalone Google Play arsenal, such as Uber, Spotify, Nest and Shazam. Notifications are presented in the typically clean Wear style - you swipe up from the main watch face to access them, swiping left or right to get rid of them and tap to see the entire message - but unfortunately you still won't be able to reply right from the wrist. And although the Qualcomm Snapdragon Wear 2100 processor packed inside provides a zippy experience around the watch when you do find yourself swiping through the basic menus, the lack of functionality means that this isn't all that impressive. Even features like music control are difficult to get too excited about. Sure, it's handy when you just want to leave your phone in your pocket, with the watch allowing you to pause and skip forward and back through your current, but after spending time with LTE smartwatches that allow for on-wrist music streaming and other standalone activity, this all just feels a bit archaic. There's no doubt that this is about as basic as the touchscreen smartwatch experience gets, but it's also difficult to knock the Guess Connect too much. What it has emphasised, it's done well. Raise-to-wake is consistent, you get the option for an always-on screen and we've experienced no real bugs in our time with the Ace — that kind of thing can't be said for every smartwatch, even when talking about Apple and Fitbit. As ever, battery life is what you make of it. If you're pumping the Ace's screen at the highest brightness with the always-on screen rolling in the background, you're going to notice a sharp decline in the battery efficiency. In our testing, with some moderate interaction, notifications turned on, always-on enabled and the screen brightness resting at the highest level, the Guess Connect Ace made it around 19-20 hours, leaving us with a dead screen relatively early on the second day of use. And while that's roughly what the company indicates, it doesn't mean it isn't disappointing. Naturally, you can stretch things out on the second day if you're willing to turn off the always-on display, reduce brightness and shutter those notifications into the background, but the fact that a minimal software experience can barely make it a day without needing to charge makes this a far less appealing watch to reach for. If there's one consolation in this regard, it's that charging things back up doesn't actually take too long. By our measure, around 1-2 hours should do it, with the charging puck resting underneath the bezel and locking into place much more comfortably than the magnetic options we've seen through other Wear rivals. The Guess Connect Ace is on sale in the UK for £279 from WatchShop.com, which kindly loaned us a sample for this review. The Guess Connect Ace ticks plenty of boxes in the design department, with this jazzy look and premium build quality pushing it into the higher bracket of Wear watches. As expected, the software takes a back seat here, with the lack of features like Google Pay tough to defend. However, if you can live with this, and the fact you'll have to charge it with your phone every night, this rounds out as a stylish Wear experience that’s still worth exploring.